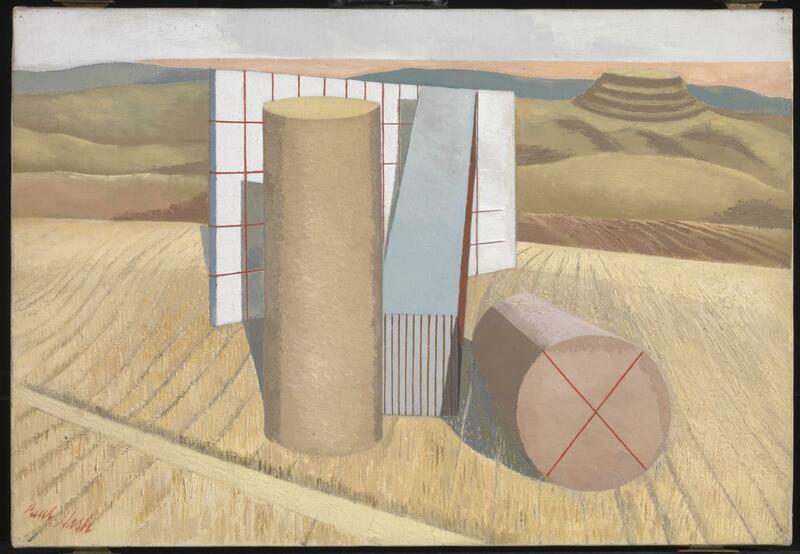 Paul Nash (1892–1946), Circle of Monoliths (1937-38), oil on canvas, 78.8 x 104.1 cm, Leeds Art Gallery, Leeds, England. The Athenaeum. In the decade to 1930, Paul Nash’s art had come a very long way, and as an art critic for the respected weekly magazine The Listener, and the Week-end Review, he was in a position of influence. In the next eight years, he was to become both a leading practitioner and advocate for modernism and internationalism in art. 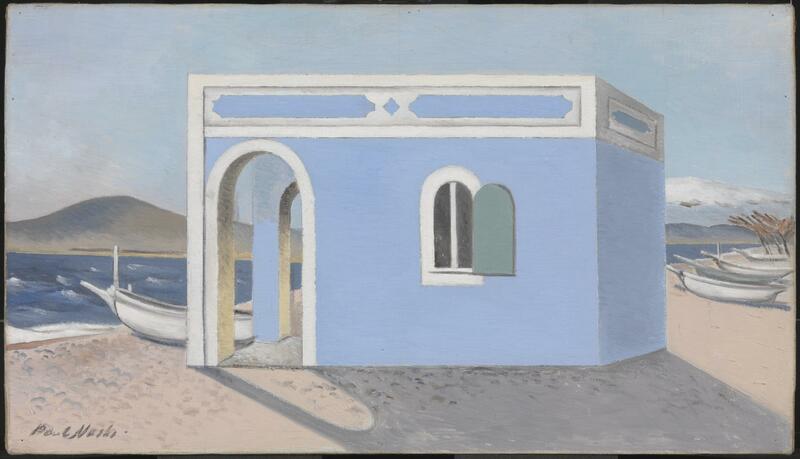 Blue House on the Shore (c 1930-31) is set on the French Mediterranean coast, which Nash visited around 1927 and in 1930. It explores the surrealist principle of incongruity, in placing a simple blue building, with contradictory perspective, on a sandy Riviera beach, among fishing boats. 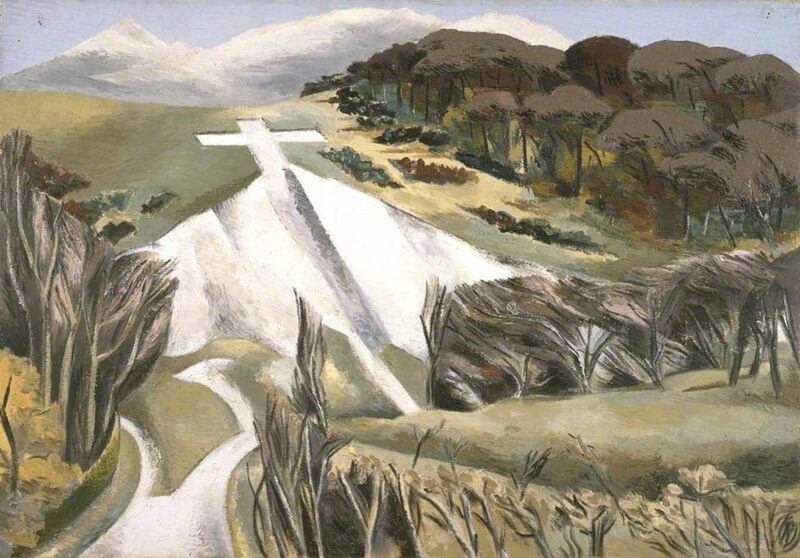 Paul Nash (1892–1946), Whiteleaf Cross (1931), oil on canvas, 53.7 x 76.1 cm, The Whitworth, University of Manchester, Manchester, England. The Athenaeum. Whiteleaf Cross (1931) may appear unreal, but is quite an accurate depiction of a cruciform hill carving in Whiteleaf Hill near Princes Risborough in Buckinghamshire, not far from Nash’s old family home. On a down set between small woods, a chalk escarpment has been cut with a trench, which extends to the symbol of a cross above. It is late autumn, with trees devoid of leaves, or their foliage a deep brown. 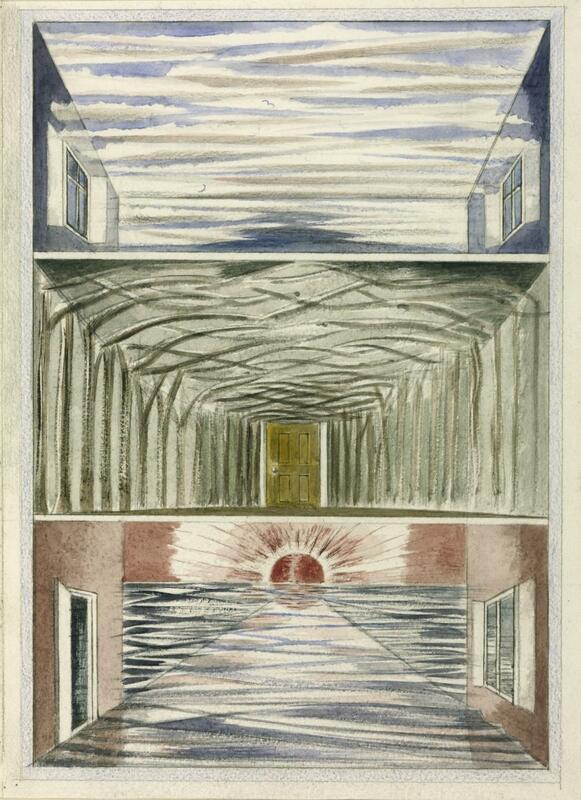 Nash’s watercolour Mansions of the Dead from 1932 is an illustration for an obscure and mystical essay titled Urne Buriall (1658), by Sir Thomas Browne, which concerns itself with death and immortality. Nash also made a second version which was shown at the International Surrealist Exhibition four years later. Nash described this painting as showing “aerial habitations where the soul like a bird or some such aerial creature roamed at will”. In addition to those ‘souls’, there are regular geometric constructions which resemble bookshelves with a spacious and airy hangar above. 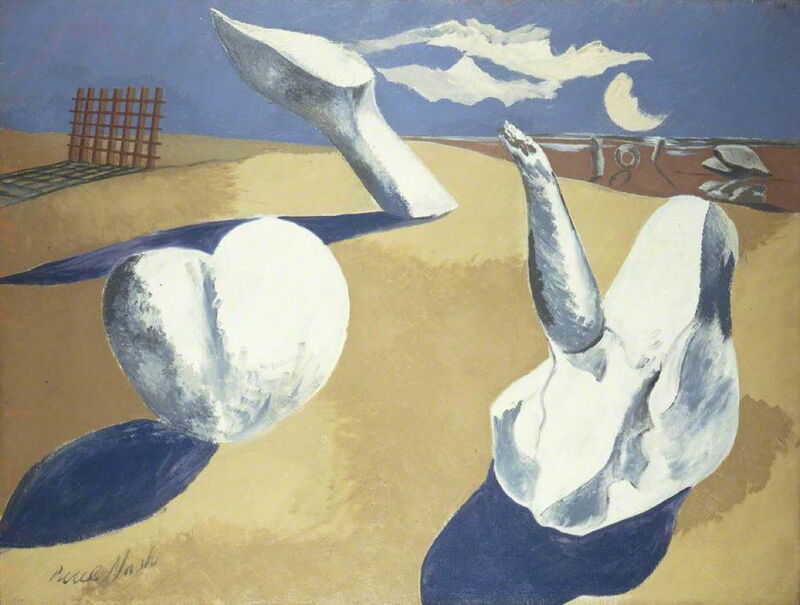 In 1933, Nash, together with Henry Moore, Barbara Hepworth, and others, founded the Unit One art movement, which started to breathe life back into art in Britain before the Second World War. He also exhibited alongside the works of Jean Arp, Joan Miró, Georges Braque, Max Ernst, Paul Klee, and Pablo Picasso. In the summer, he visited the neolithic landscapes of Silbury Hill and Avebury, in Wiltshire, England, whose magic and sinister beauty were to inspire him in several works. In the late autumn, the Nashes went to London, then on a long trip through France to Gibraltar and North Africa. They returned to England the following summer, living in a cottage on the coast of Dorset near Swanage. Paul Nash was promptly invited by John Betjeman to write a guide to Dorset for the popular Shell Guide series. That was published just over a year later, in 1936. 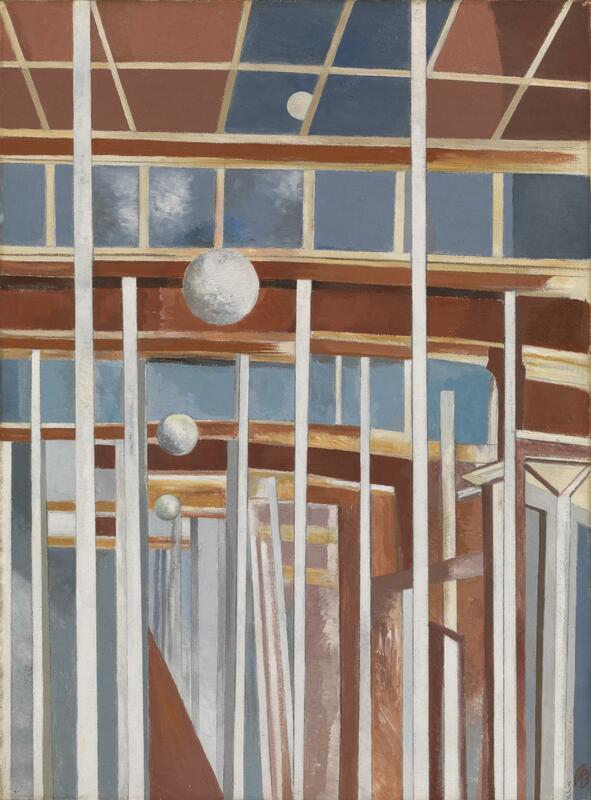 Voyages of the Moon (1934-37) develops ideas which Nash first expressed in a drawing of light bulbs reflected repeatedly in the mirrored walls of a restaurant in Toulon, France. He combines multiple spheres with a forest of vertical rods, which is reminiscent of a lunarium, a form of orrery showing the movements of the moon. This is set inside a spacious hangar or warehouse with high skylights. Equivalents for the Megaliths (1935) was inspired by the neolithic landscapes of Wiltshire, here the massive standing stones of Avebury in particular. Nash provides rolling downs and ripe grainfields as the basis for this painting. In the distance is a geometric representation of Silbury Hill, and in the foreground are clean and precise modern solids, the more recent equivalents, perhaps, of the standing stones which they appear to have replaced. In 1936, Nash took part in the first International Surrealist Exhibition in London, showing among other works photocollages and an objet trouvé of a piece of wood retrieved from a stream, as well as several of his paintings. The Nashes moved again in the autumn, this time to a large house in Hampstead, near London. The following year, he had a large solo exhibition at the Redfern Gallery in London, and visited the White Horse hill figure cut into the chalk down at Uffington in Berkshire. 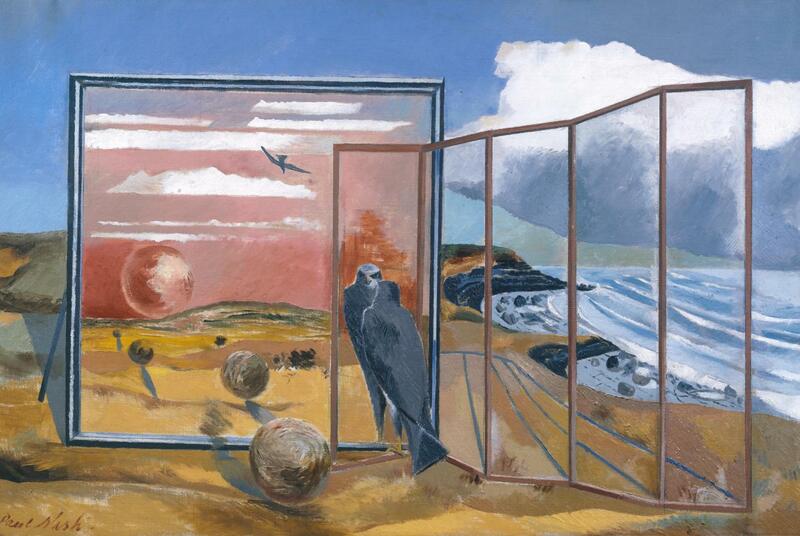 Landscape from a Dream (1936-38) is one of Nash’s most complex and elaborate surrealist paintings, inspired by Freud’s theories of the significance of dreams as reflections of the unconscious. Nash locates this collection of incongruous objects on the Dorset coast, a landscape which he associated with the praeternatural. Dominating the scene is a large framed planar mirror, almost parallel with the picture plane. Stood at the right end of the mirror is a hawk, which is staring at its own reflection, which Nash explained is a symbol of the material world. To the left, the mirror reflects several floating spheres, which refer to the soul. The reflection shows that behind the viewer, a red sun is setting in a red sky, with another hawk flying high, and away from the scene. To the right of the hawk is a five-panelled screen which is made of glass, through which the coastal landscape can be seen: it is a screen which does not screen. 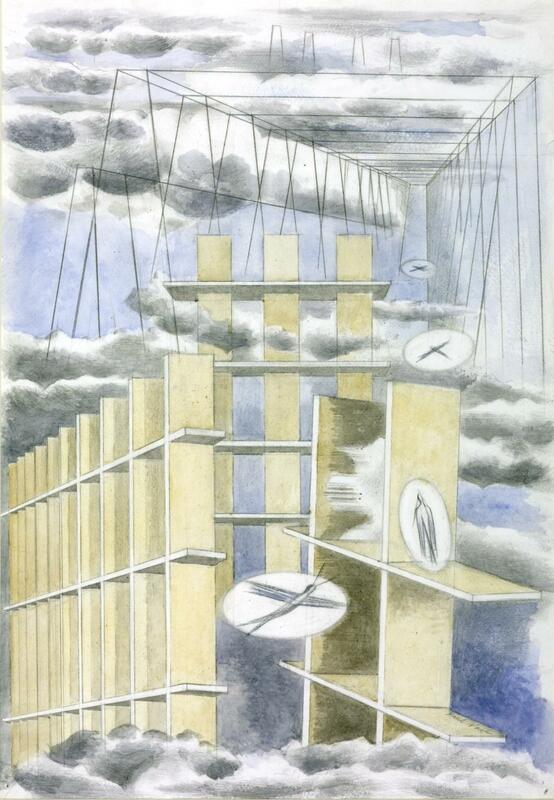 Nash’s watercolour Three Rooms of 1937 was a response to the International Surrealist Exhibition of the previous year. The three rooms have become taken over by the sky (top), a forest (middle), and the sea (bottom). The work’s graphic elements are reminiscent of the paintings of William Blake. Circle of Monoliths (1937-38) is one of a pair of complementary paintings of the same title, which Nash made over the same period. 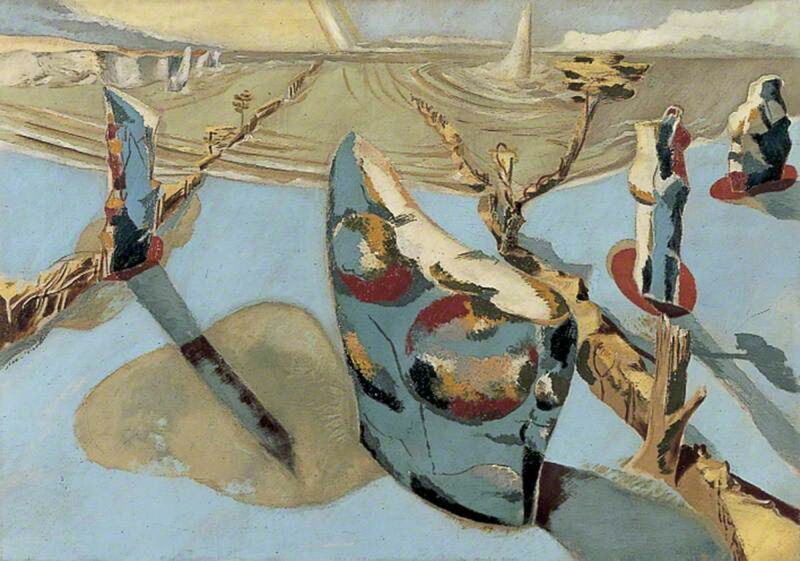 The other (currently in a private collection) shows a similar arrangement of rock-like objects on a coast with cliffs. What might at first appear to be a collection of completely abstract images turns out to have strong roots in the physical world. Like its companion, the landscape is of chalk cliffs (upper left) and sea, with a large chalk pinnacle just to the right of centre; these are inspired by the coast of Dorset, but made to appear unnatural by their unusual colours. Two broken ridges run from the foreground into the sea. These are composites of old hedges, stone walls, and the rock spines which are embedded in beaches along the Dorset coast, with occasional trees, again in strange colours. The forms of the larger objects scattered across the pale blue beach are those of rocks and other found objects, which Nash collected. Their surfaces appear to be ‘silvered’ to act as mirrors, and reflect spheres which symbolise the soul. Paul Nash (1892–1946), Nocturnal Landscape (1938), oil on canvas, 76.5 x 101.5 cm, Manchester Art Gallery, Manchester, England. The Athenaeum. Nocturnal Landscape (1938) was another response to the International Surrealist Exhibition. Nash populates a sparse desert-like landscape with a collection of incongruous objects. These have their inspiration in forms he saw in nature, and in found objects, At the upper left is a grille, which echoes his earlier geometric forms. The moon’s crescent shape has been distorted, as if bites have been taken from it. By 1939, as another major war looked imminent, Nash was at the height of his surrealism, and on the threshold of once again becoming a war artist. Posted in General, Painting and tagged Betjeman, Blake, landscape, modernism, Nash, painting, Picasso, Surrealism. Bookmark the permalink.